ISO/IEC STANDARD. ISO/IEC. Fourth edition. Reference number. ISO/IEC (E). Provläsningsexemplar / Preview. Cartes d’identification — Technique d’enregistrement —. Partie 6: Bandeau magnétique: Haute coercivité. STANDARD. ISO/IEC. Reference number. ISO/IEC INTERNATIONAL. STANDARD. ISO/IEC. Third edition. Identification cards — Recording technique —. Part 6: Magnetic. You may experience issues viewing this site in Internet Explorer 9, 10 or Magnetic stripe — High coercivity, high density. Magnetic stripe — High coercivity. Identification cards — Recording technique — Part 2: Accept and continue Learn more about the cookies we use and how to change your settings. Magnetic 7181-6, Recording tracks, Identification methods, Identity cards, Data recording, Machine-readable materials, Magnetic cards, Data media, Magnetic stripes, Cards, Coercivity, Coding data conversionPhysical properties of materials. This website is best viewed with browser version of up to Microsoft Internet Explorer 8 or Firefox 3. Identification cards — Recording technique — Part 4: The below info is provided to assist all in obtaining documents relating to card construction and magnetic stripe related information: Magnetic stripe — Low coercivity. Identification cards — Recording technique — Part 3: The faster, easier way to work with standards. Find Similar Items This product falls into the following categories. Enter the ISO you are iiso for the ansi website and then click on the result for a summary of what is included in the document. Please download Chrome or Firefox or view our browser tips. Click to learn more. Your basket is empty. Location of Tracks 3. 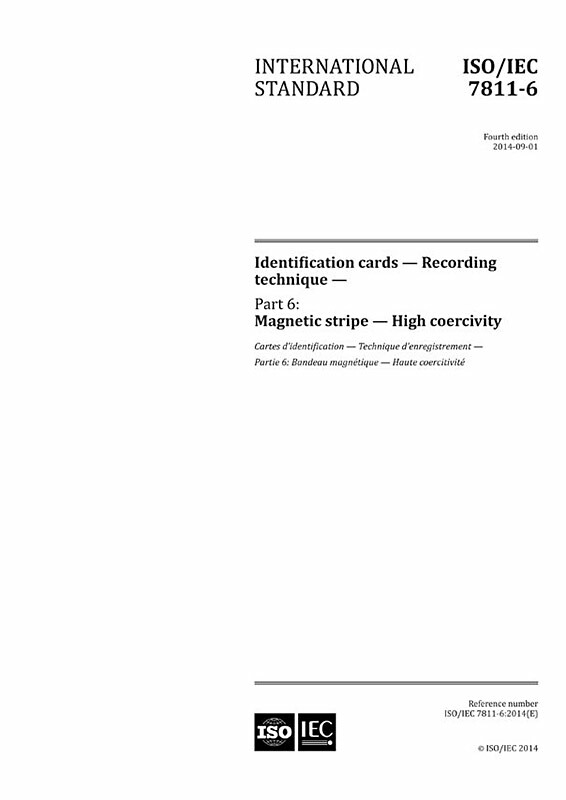 Magnetic stripe — Coercivity of oe. The following documents and their titles may assist you on your specific area of interest: Identification cards — Recording technique — Part 5: You may find similar items within these categories by selecting from the choices below:. Embossing available in English only. Identification cards — Financial transaction cards — Magnetic stripe data content for track 3.